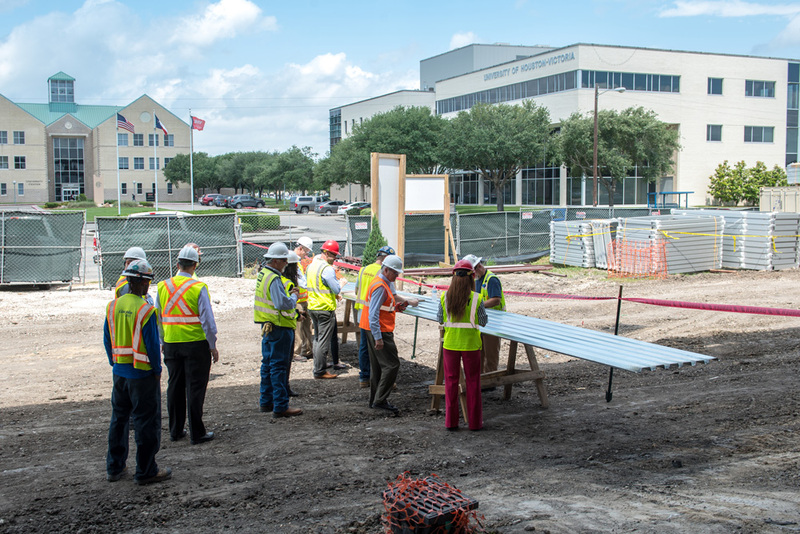 Representatives from the UH System, UHV, BE&K Building Group, Gensler architecture firm and construction workers sign a piece of galvanized steel decking during Wednesday’s ‘topping out’ ceremony to celebrate the end of major construction on University Commons, UHV’s new student center and library. 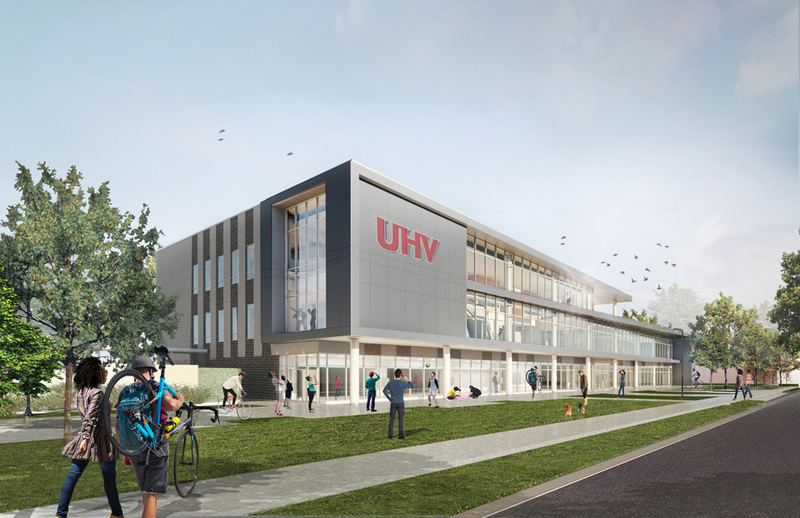 This rendering shows what UHV University Commons will look like once it is completed. Construction on the University of Houston-Victoria’s new $32 million student center and library passed another milestone Wednesday when a “topping out” ceremony took place, marking the end of foundation and framing work on the building. “The UHV University Commons is going to be one of the most beautiful buildings on campus, and we are ready for it to open for our students,” UHV President Vic Morgan said during the ceremony. Representatives from the UH System, UHV, BE&K construction, Gensler architecture firm and construction workers each signed a piece of galvanized steel decking that was put in place on the roof of the building later in the day along with a small evergreen tree, as is tradition during a topping out ceremony. Groundbreaking on the 80,124-square-foot, three-story University Commons took place in April 2017, and the building is expected to be completed by January in time for the start of the spring semester. 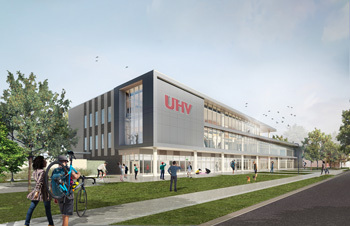 Although the majority of the building will be ready by October, the library needs to move into the new building between semesters in order to avoid a disruption of services to UHV and Victoria College students and faculty. In addition, a project that will allow UHV to reduce the number of traffic lanes on Ben Wilson Street in front of the University Commons must be started in order to allow students and employees to safely cross the street. Jay Lambert, vice president for UHV Student Affairs, said he is excited about University Commons for both the students and employees. “The University Commons will completely change how we serve students, how they connect to the university and their general sense of belonging,” he said. The new building is located on the east side of Ben Wilson Street, directly across from the UHV University Center. The first floor will include a food court; a market with a coffee bar featuring Starbucks coffee and grab-and-go food and convenience items; a Barnes & Noble bookstore; a video game area; a multipurpose room with seating for up to 250 people; and study and lounge areas. The food court will feature Chick-fil-A and Asado, a Latin American fast-food restaurant serving design-your-own tacos, burritos, ensaladas, rice bowls and tortas. The food court will have space for a third restaurant that will open once student enrollment is larger. The second floor will have space for the university’s Student Success Center, Student Life & Services, and offices for the UHV Student Government Association and other student organization offices. The new library, known as the Learning Commons because of its modern feel, will include public computers, circulation and reference desks, and a makerspace, an area that offers library patrons an opportunity to create materials. The makerspace could include a small recording space, media conversion area and specialty electronics such as a 3-D printer, a large-format printer and a planetary scanner. The third floor will house the Victoria Regional History Center, offices, meeting rooms, study spaces and the most-used books in the library’s collection. The remainder of the collection will be stored off-site and retrieved as needed. A deck on the third floor will have an outdoor seating area that overlooks the rest of campus. Alvaro De La Cruz, the 2017-2018 UHV Student Government Association president, cannot wait for the University Commons to open so that he can enjoy it before he graduates in a year. In February 2015, UHV students living within a 50-mile radius of Victoria voted on whether to fund the student center. More than 80 percent voted in favor of the fee, and then a few months later, the Texas Legislature approved a bill allowing for the student fee assessment. The fee first was assessed in fall 2015. That year, the Legislature also allocated $60 million to UHV in construction bonds for academic expansion and land acquisition. A portion of that money is funding the library inside University Commons. Go to www.youtube.com/watch?v=b-nzisSnCwQ to see a flyover video of what the University Commons will look like once it is finished.